Homespun Stitchworks..... For the love of vintage: What a beautiful vintage fair! ... The Art of Vintique, read all about it! What a beautiful vintage fair! ... The Art of Vintique, read all about it! The show at Great Barrington Village Hall on Saturday 3 May was outstanding! Three ladies had organised it and it was their first event. The setting was stunning I have to say and the sun was shinning and warm. When you drove around little country lanes to the Hall, there were car park attendants in the field opposite, and then all you had to do was just walk across the road and a little way along. The Village hall itself is enough to make you happy but when you walked through the gates with lots of lovely vintage stalls outside as well as filled to the brim inside with lots stall holders all selling wonderful vintage goodies, well you were in vintage heaven. You had to pay £2 entry fee which was going to charity and then you had a choice of pink champagne or elderflower fizz ( these were complimentary) in addition there was a stunning hamper that you could buy a ticket for to win in a prize drawer later in the day. The roving Oxford and Cotswold hills shone in the sunshine and greeted the hoards of vintage lovers. The doorway to this stunning vintage fair! with fizz to greet you as you went inside. Firstly I went along to find Jo from Hesta Nesta, I had found out that she had some more of that stunning vintage paisley with the pink, duck egg, beige and green so I had ordered it from her prior to this event. I had also asked her to hunt for a vintage piece of quilt ( and she had found one with Victorian fabrics in it and made around 1920) so we had a lovely chat and I thanked Jo and paid for my purchases. By now my husband and I decided after the journey from Bournemouth we would go to the little cafe inside and sample a piece of cake each and a coffee, there was a choice of cakes and flapjacks and they were making soup for anyone who wanted it at lunchtime. There was background music playing and the tables were up on the stage part so you could look at all the inside stalls and soak up the lovely atmosphere. Look at the ceiling in the hall and the beautiful gallery at the far end painted cream. They do an awful lot of wedding receptions at this hall and there is no wonder! We then went looking around the lovely stalls that were there amongst the white bunting that had been hung up across all the ceiling. This stall belongs to Suzanne and her business is called Hearts and Kisses. There are some beautiful products on here. All handmade by Suzanne herself. She makes hearts to hang with quirky sayings on. There are brooches made from vintage blankets and Suzanne makes stunning vintage 'patches' to sew on and embellish your clothes with. It truly was a very beautiful and unique stall. We had a wonderful chat and found that we were both quirky in our likes and dislikes and mad on vintage! The lovely Suzanne with a vintage suitcase that she has embellished! It is so beautiful. If you look carefully at her jacket you will see on her sleeve one of her 'patches' she makes. Suzanne had also stitched a piece of vintage fabric above her jacket pocket to look like a hankie ..... wonderful! Then I found the Will and Bea stall and made a few more purchases. Including some of her button cards which will be part of the next vintage giveaway on here. This stall always looks so pretty! Will and Bea stall and you can just see some of the vintage button cards. You can follow Will and Bea on facebook. Then we went wandering around inside looking at all the other wonderfully dressed stalls. Stall holders had added vintage jugs of wild flowers to their tables and button bowls to rummage about in. All were talkative and pleased to help in anyway and direct you to things you were looking for, even if it was not on their own stall. It was time to move outside into the sun shine and wander about the stalls that were out there. All under white gazebo's. The sun was very warm by now and it was great to look at all the surrounding views. Various stalls outside with vintage products. We wandered about outside in the warm sunshine and I then spotted a whole stall dedicated to Vintage blankets...... The vintage Blanket Co. The owner is a lovely lady named Natasha. I purchased a most wonderful blanket from her for one of my important up and coming designs. Natasha showed me all kinds of blankets from Welsh to Witney, and is very knowledgeable and listens to your needs. When I told Natasha I usually cut them up, I think she went a little pale! But I informed her that this one would not be!... It is is in immaculate condition..
We were coming to the end of all the beautiful stalls outside but I had one final one that was very interesting to me, Suitably Vintage. The lady who owns this business is Sue and reliably informs me she only does this for fun!! Amazing selection of Victorian bits of fabrics and quilt pieces and a fabulous jar of vintage cotton reels! Huge jar of vintage cotton reels made for rummaging about in.... I found a wee little spool of J P Coates thread in the most stunning green....... It had to come home! We had spent a wonderful 3 hours wandering around this vintage fair in it's picturesque setting and it was by now time for lunch. On the way to the fair in the little village we had passed a pub and thought we would try that out. There are plenty of lovely tables inside and out. 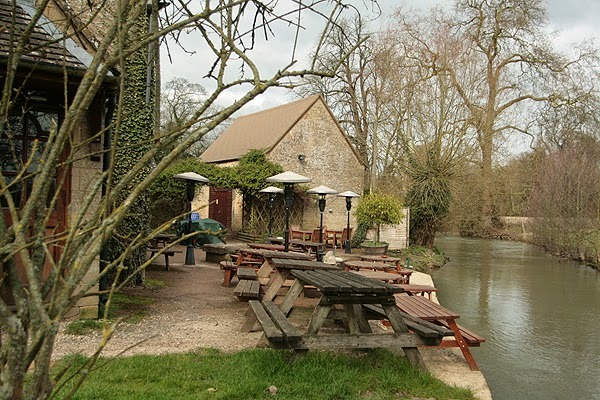 The outside tables are right by a lovely river and that is where we had our lunch. There were ducks swimming about and the sun was nice and warm. This is the Fox Inn..... Great setting and incredibly good food. We had decided to make a day of it and not very far away is a great village called Burford so we headed there and walked around all the tiny shops that are all independent. We had a coffee in a lovely cafe and went into an antique shop and the most incredible embroidery and stitching shop. The silks and the hand dyed wools were in every colour and shade imaginable! Also whilst there I visited the patchwork and quilting shop called cupcake cottons..... it had to be done! 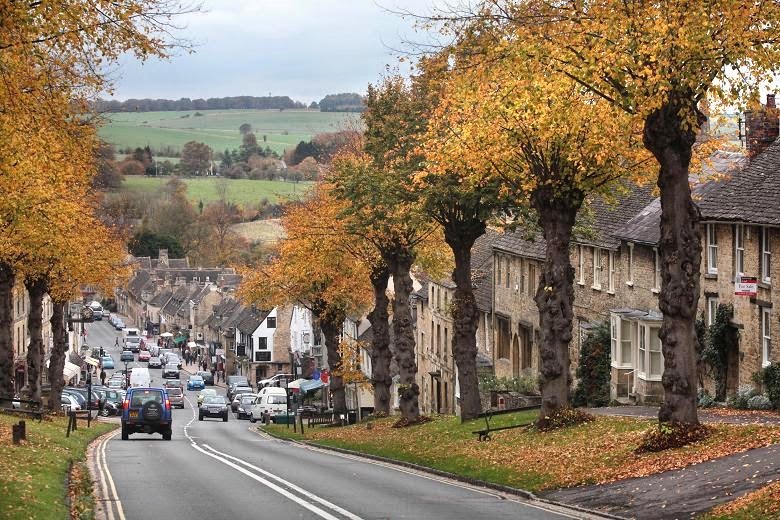 Burford high street... view from the top. 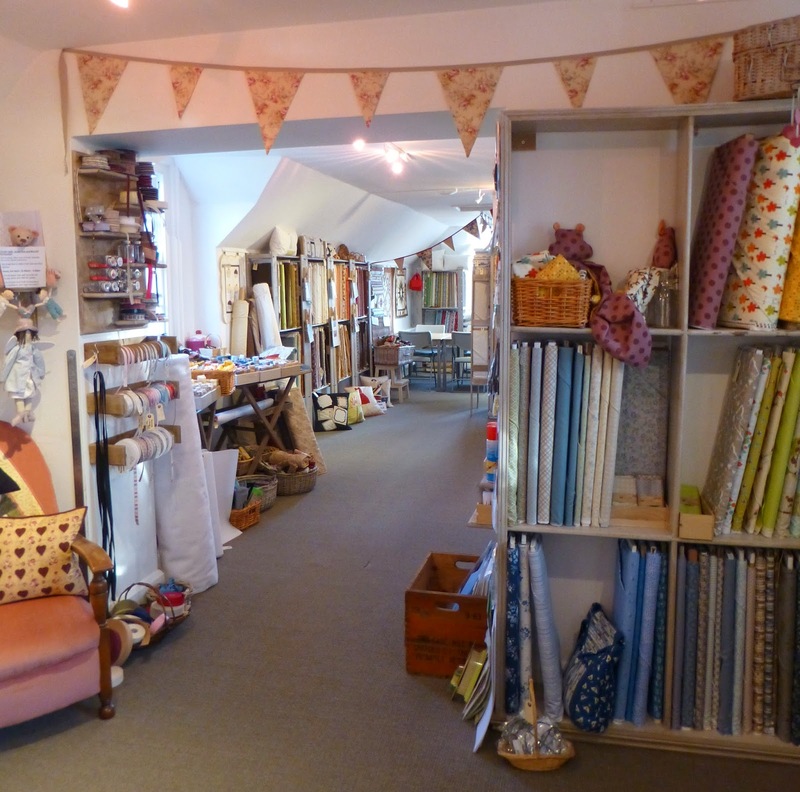 We had a most great day out and I had picked up some beautiful vintage fabrics and goodies for my designs. We decided to wander home slowly and stop off for dinner in one of my husbands favourite places called Castle Combe. We had dinner at the Castle Inn. Great food and service and again a very beautiful setting. 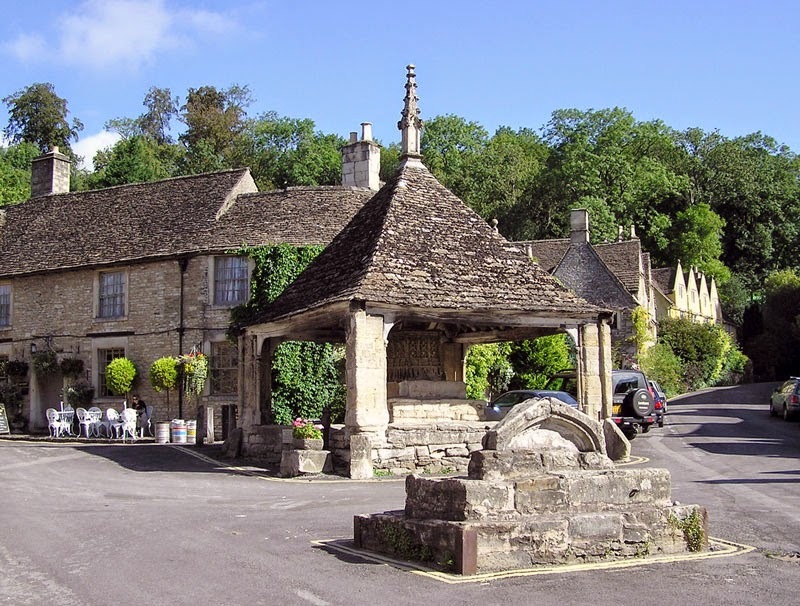 Castle Combe village with a view of the cross and the Castle Inn. We had such an incredible day, partly business and partly a day out we like to say that we just bumble.... wander around and take in all the sites. We would like to thank all the wonderful stall holders at The Art of Vintique and the organisers and every one we met along the way! p.s.... later in the week I will show you some pictures of my vintage purchases! and I am off to another fair on Wednesday..... more on that later. Thank you for coming to our first event. It sounds like you had a great time. We all enjoyed it very much and it was lovely to see our hard work pay off in everyone's happy faces. We're definitely going to do another fair and hope you'll be free to visit us again. Now off to share your blog on our facebook page. Joasia x - The Art of Vintique.